In its initial "boost phase," State investment in the low-hanging fruit of public infrastructure offers a high yield. Examples include rural electrification, the rapid expansion of the railroad system, the construction of the Interstate Highway system, and the publicly funded research and development of science and technology that enabled the basic protocols and software infrastructure of the world wide web. As the State expands its share and control of the economy, this political allocation of capital and national income also expands. As the State grabs an ever-larger share of the economy and extends its Central Planning to every layer of the economy, the "best game in town" inevitably becomes lobbying the State for funds and perquisites. Private investment decisions start being made on the basis of State subsidies and tax loopholes rather than market-based metrics. This dynamic is especially pernicious: not only does the State increasing choose to fund projects with diminishing returns as a result of political allocation, the State's expansion of command and control distorts private investment as well. The Expansionist State thus distorts the investment decisions of the entire economy, public and private. Households don't buy a home because it is a fruitful investment, they buy it to obtain the mortgage interest deduction. Corporations buy medical-supply companies because they see Medicare as low-risk cash-cow, and so on. Political allocation of the national income knows no bounds. Politically, there are never any limits. If tax revenues aren't keeping pace, then the State must borrow increasing sums of money to fund its spending. Politicians and their State fiefdoms/private-sector masters, the cartels of finance, defense, healthcare, education, construction, etc. are screaming for more funding; where it comes from is secondary to easing the political pain. 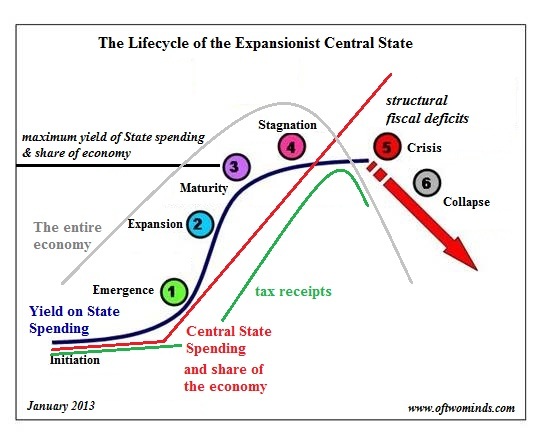 Tweaking tax policy or raising the debt ceiling will not change any of these dynamics.The Expansionist State is on the path to implosion (insolvency) and collapse, i.e. a political crisis. 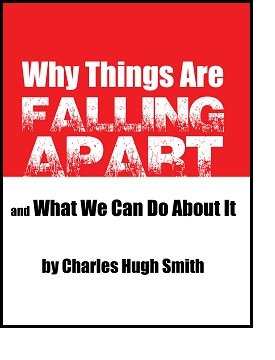 If we understand the core dynamics of the Expansionist Central State--the political allocation of scarce national income to favored constituencies and cartels--we understand why this process is inevitable. Thank you, Peter K. ($500), for your truly beyond-generous contribution to this site -- I am greatly honored by your support and readership. Thank you, Kenneth L. ($20), for your most-welcome generous contribution to this site --I am greatly honored by your support and readership.